I've just completed an independent and unbiased study. 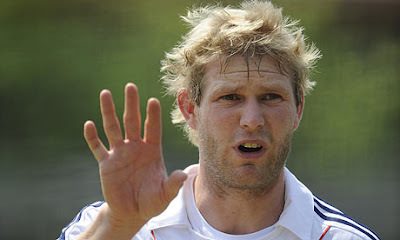 I asked a hundred people 'what is Matthew Hoggard doing in this photo?'. 99/100 said he's waving goodbye to NWG...the other 1 came out with a completely unrelated and random answer that he's about to catch a ball. Sorry Nightmare, the people have spoken. NWG sees what you're trying to do Stani. And it's not going to work. She's still smiling. No! It's true. I stood for two hours on East Ham high street freezing my plums off questioning old ladies and that's all you have to say? Oh well, at least I can be content with the fact that he only made you blush "a little". Doohoohahaha, dont be editing that now! East Ham high street. Well of course that was the response. What about in ________ where NWG lives? Would have been totally different. Errm, East Ham is not a million miles from you is it? Although, people do say that South London is like a whole new world. ....especially little old ladies. I told them you was a fan of knitting since you went to so many England games and because there is hardly anything to watch, you keep yourself entertained by knitting stuff. They still voted for Boris though because, as one little old lady put it, "Eee looks jus like Maffew Oggard". Hahahahahah!!! I better stop, people will start hating me. I'm taking a forced break from you. Sorry Nightmare, don't miss me too much. Hoggys fingers arn't that bad Stani. East Ham - that's the right side of the River at least! I hope you're not comparing his to yours! East Ham...that was a good one 668! Nightmare will love you. Nice to see that Hoggy made such an effort to scrub up and look handsome for you, NWG. Paddy! Retract your comment and apologise immediately! I have so much respect for Nightmare, I could never imagine such a thing. She's like a big sister to me. And there I was thinking I'll come back and wish Nightmare and everyone a Merry Christmas. You put me off now.